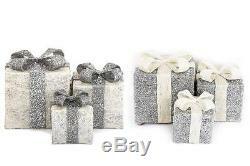 Set Of Three Light Up Presents Ideal For Christmas or Birthday Decorations. Beautiful Set Of Three Light Up Present Boxes. Will make for great decorative items at Christmas or Birthdays. (Colour is for ribbon colour). LRG PC APPROX: 25X25X25CM / 5024418752295. MDM PC APPROX: 20X20X20CM / 5024418752301. SML PC APPORX: 15X15X15CM / 5024418752318. The item "Set Of Three Light Up Presents Ideal For Christmas or Birthday Decorations" is in sale since Tuesday, October 04, 2016. This item is in the category "Home, Furniture & DIY\Celebrations & Occasions\Christmas Decorations & Trees\Christmas Tree Ornaments". The seller is "ukgiftandcandleshop" and is located in Luton.